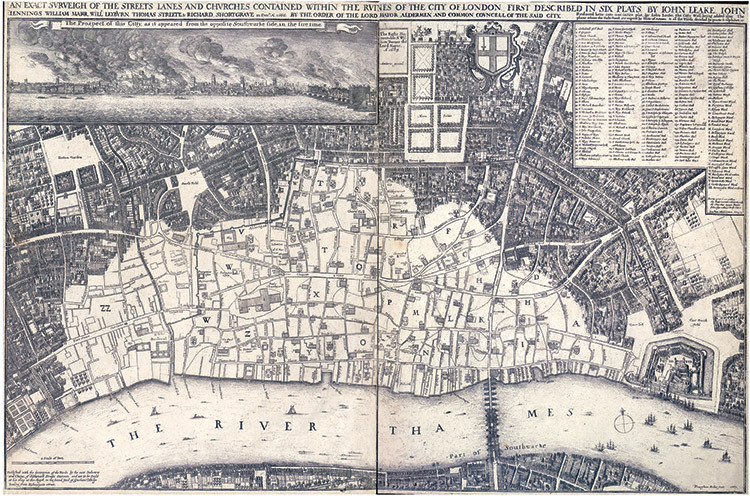 The rebuilding of London required an image of what had been lost. Kate Wiles shares one such survey from 1669. A few days after the fire’s end on September 5th, 1666, several plans for rebuilding the gutted City, with imaginative street layouts, were submitted to Charles II by figures including the architect Christopher Wren, the natural philosopher Robert Hooke and the surveyor Peter Mills. None was used, as they all proved impractical for various reasons, but in order for rebuilding to happen accurate plans were needed. The king ordered a survey and the results were drawn up on six plates by John Leake in March 1667. Wenceslaus Hollar produced the engraving and added to it contrasting views of the City from Southwark, on the south bank of the Thames, before and after the fire. No copy of that original map survives but a reduced version, dedicated to Sir William Turner, then Lord Mayor of London, was issued in 1669. This reduced survey contains a key at the top right listing the buildings destroyed in the fire; lost livery halls are indicated by their coats of arms and wards are marked by broken lines and identified by capital letters, which are also listed in the key. Although titled an ‘exact surveigh’, the street plan is simplified, perhaps to be expected given its swift production. The Rebuilding Act of 1667 specified that new houses must be constructed of brick and stone, with tile roofs. A second rebuilding act in 1670 led to the construction of 51 churches, as well as St Paul’s Cathedral (the site can be seen on the map, left of centre). Wren and Hooke were commissioned for this rebuilding and by 1696 all the new churches were in use. St Paul’s was not finally completed until 1710 but was in use from 1697.